Chris Bergstrom, Scott White, Alan York and David St. Gene have been playing together on Okinawa for two years now as The Wenzels. They are all four military members who proudly hail from the 18th Transportation Squadron and 353rd Special Operations Squadron on Kadena Air Base. 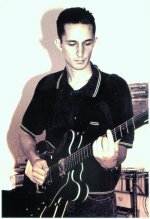 Chris, 26, on lead guitar/vocals; Scott, 28, on drums; Alan on bass; and David on keyboard and backup vocals have been performing cover hits from bands such as Oasis, Blink 182, Bush, Depeche Mode and Nirvana live at Fujiyama’s, The Hideaway, Wizards and also for local parties and base functions. When Chris and Scott were asked how they met, they both laughed. Although they perform a lot of newer pop/alternative music, The Wenzels’ distinct sound was greatly influenced by The Beatles. Another major influence on The Wenzels has been pop-rock, US guitar artisans from Los Angeles, Weezer. The Wenzels were chosen in September for the great honor of being featured on a “Tribute to Weezer” album set to release in December 2000. They will record the song “Mykel and Carli”, a Weezer hit, on the CD. Chris explained the tragic story behind “Mykel and Carli”, “I used to know Mykel and Carli personally. We used to exchange letters back in 1994/95. They were sisters and the founders of the Weezer fan club. I received autographed pictures, T-shirts, and stickers from them as well as interesting hand written letters. Sadly, they were both killed in a terrible car accident and after, there was a major label release called “Hear You Me”, a tribute to Mykel and Carli. I felt that out of all of the Weezer songs we could have recorded, this one was special and held a personal tie to me. The Wenzels have already recorded two CD’s, which are available in MP3 format from MP3.com, however they’re almost done recording their third. It too will be available from MP3.com. Their CDs can also be purchased by visiting the website, where there is a lot of information on the group itself, such as biographies, pictures, and tour and CD release dates. “We’re just really excited to have been given these opportunities. We continue making and recording our own original material, each time trying to top the last,” Chris told Japan Update. For more information on The Wenzels or to find out when their next live performance will be, log on to www.mp3.com/thewenzels.